Directions: Children, ages 0 to 11, give 3 drops or pellets orally (ages 12 and up, give 6 drops or pellets) as needed or as directed by a healthcare professional. Under age 2, crush or dissolve pellets in purified water. Sensitive persons begin with 1 drop or pellet and gradually increase to full dose. WARNING: If symptoms become severe or fever persists for more than 48 hours, consult a licensed healthcare professional. Active Ingredients: Influenzinum 30x, Aconitum napellus 15x, Arsenicum album 15x, Belladonna 15x, Bryonia 15x, Camphora 15x, Cina 15x, Cinchona officinalis 15x, Eupatorium perfoliatum 15x, Ferrum phosphoricum 15x, Gelsemium sempervirens 15x, Hepar sulphuris calcareum 15x, Ignatia amara 15x, Natrum muriaticum 15x, Nux vomica 15x, Phosphorus 15x, Pulsatilla 15x, Salix nigra 15x, Veratrum viride 15x, Chamomilla 3x, Echinacea 3x, Hydrastis canadensis 3x. Aconitum napellus: Acute, sudden and violent illness with high fever; Otitis media (ear infection); Restlessness. Arsenicum album: Anxiety, exhaustion, restlessness; Food poisoning; Fevers; Glandular swellings. Belladonna: Abscesses; Croup; Intestinal fever; Glands swollen, tender, red; Great children's remedy. Camphora: Cold sweat; Heat of the body, with redness of face; FIrst stages of a cold with chilliness and sneezing. Chamomilla: Especially of frequent employment in diseases of children, where peevishness, restlessness, and colic give the needful indications; Night sweats. Cina: Chilliness with thirst; Children's remedy; Child is restless, tosses about. Cinchona officinalis: Stages of chill, heat and sweat; Dehydration; Fever. Echinacea: Abscess; Blood poisoning; Fevers; Poisoned wounds; Vaccination effects. Eupatorium perfoliatum: Fevers; Great weakness and prostration (exhaustion) during fever. Ferrum phosphoricum: Fevers of unknown origin; Colds; First stage of otitis (ear infection); Bronchitis of young children. Gelsemium sempervirens: Fever; Chills; No thirst with fever. Hepar sulphuris calcareum: Abscess; Ear infections; Glandular swellings; Profuse sweat. Ignatia amara: Irritable; External heat with internal coldness; Chill with thirst, not relieved by external heat. 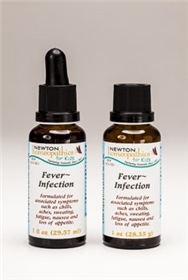 Natrum muriaticum: Heat, violent thirst increases with fever; Great remedy for certain forms of intermittent fever; Shivering with and without thirst. Nux vomica: Irritable nervous system; Body burning hot, but chilly must be covered. Phosphorus: Painless fevers; Profuse perspiration; Burning heat, up back. Pulsatilla: Mucous discharges are profuse, bland, thick, yellowish green; Chicken pox; Measles; Mumps; Children like fuss and caresses. Salix nigra: Fevers; Muscle soreness; Red swollen face; Night sweats. Veratrum album: Face flushed, livid turgid, but becomes faint on sitting up; Suppurative (produces pus) fevers with great variation of temperature.